With a name like the Biscuit Factory, you might expect this gallery to be industrial and stuck in the past, or entirely too focused on confectionary. But this warm and modern space holds a wide variety of art styles, from brightly painted pottery and minimalist ceramics to pattern-filled ink illustrations and bold landscapes. If you’re looking for a plain seascape or typical fruit still life, you won’t find it here. Award-winning author and illustrator Catherine Rayner leads the autumn exhibition with her animal illustrations. Each of her movement-filled paintings maintain that sense of childlike curiosity through the animal’s inquisitive gazes. Given undeniably sweet names such as ‘Prentice’ or ‘Silvie and Hector’ her illustrative style is reminiscent of many a childhood book. The images give the viewer that peculiar feeling of connection that comes from locking gazes with an animal in the wild. Rayner’s subdued colour palette mixed with her free use of line gives each animal a true sense of life. Animals are a common theme in the autumn exhibition, with Peter Sales’ large lacquered steel sculptures of birds (a rabbit or two thrown in as a nod to Rayner), and Zoe Robinson’s triptych of lioness sculptures and rather large crocodile. Contrary to the common expectation of autumn as a time of withering leaves and chill, this exhibition is bursting with natural life of all kinds. Birds are featured especially frequently (an entire wall dedicated to their vibrance and movement), which completely banishes any dim picture of autumn the viewer may have had. Even the rare still life or landscape empty of animals, people, or large natural elements (such as paintings by Richard Sowman and Mike Hall) is full of warmth from the use of light and shadow. There also appears to be a great contrast between the natural and the manufactured. Bold, nature-filled paintings appear alongside minimalist works such as the simplified and bright architecture-focused paintings by Megan Rea. Both of these are still a far cry from a dismal, wet autumn painted in dull, dark hues. 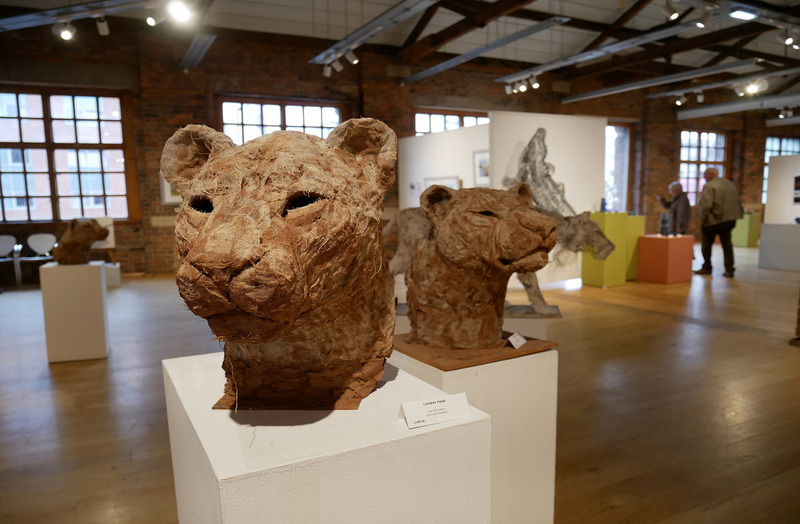 If you’d like to see autumn painted in a new light, look no further than the Biscuit Factory exhibition.